Deer can be a two edged sword. They are beautiful to watch but they can be so destructive to your flowers, trees, and gardens. We found two solutions that seem to help in keeping the deer away from our flower beds. One is placing bounce dryer sheets in front of the flowers after each rain. The other is a homemade recipe. The homemade recipe is as follows: Mix 1 egg, 1 c. milk, and 1 tsp vegetable oil in a gallon jug. Shake the jug to break up the egg. Add water to fill the jug almost to the top. Add 1 tsp. dish soap. Put solution in a squirt bottle. Squirt generously on the flowers to be protected. Reapply after each rain. 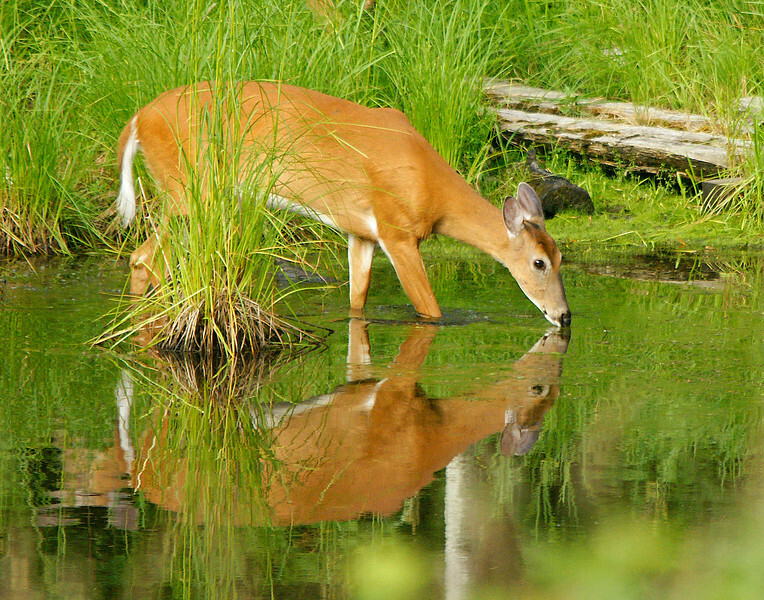 Whitetail deer are very plentiful along the North Shore. 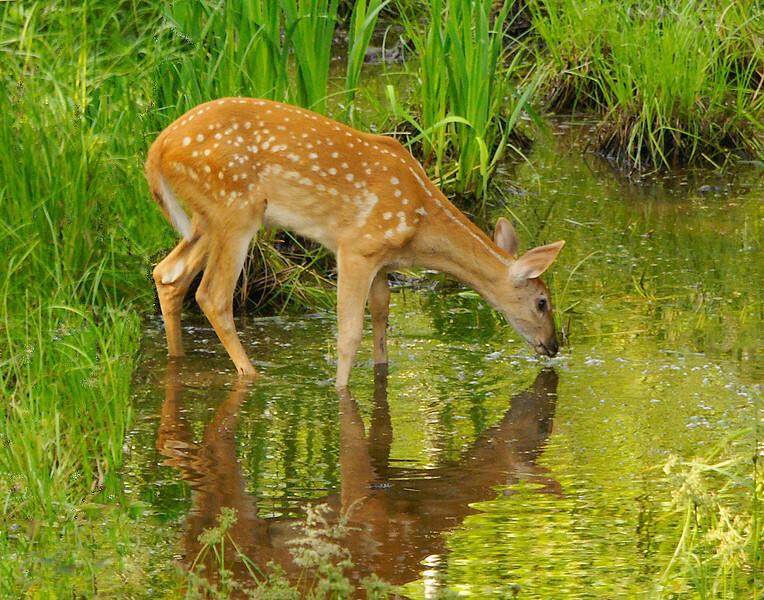 Over the summer we have had two deer families frequenting our wildlife ponds next to our house. 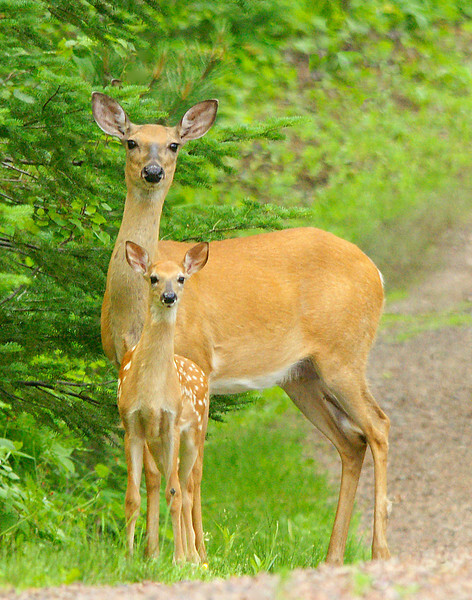 One doe has one fawn and the other has twins. Deer are so beautiful when their summer hair has that reddest glow. Just about daily we see one family or the other walking along the edge of the ponds feeding on the abundant plant growth. Last week the one mom with twins must have weaned them as the one baby was not happy. It followed her around the pond bawling like a young calf. Occasionally, the mom would look at it and then go back to feeding. Mom held her ground and soon the fawn stopped whining.